This week, I am not knitting any new projects, just trying to finish old ones. I finished through Clue #3 for the Jimmy Beans Downton Abbey Mystery KAL. This week's clue was quick, easy, and boring, which meant it was relaxing to knit while watching Downton Abbey. I'm looking forward to what we'll be doing where we did the provisional cast on; I hope we'll find out next week. 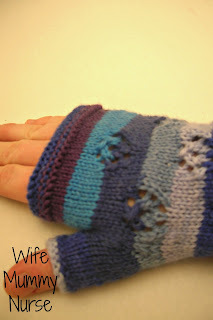 I'm currently browsing one of my Christmas gifts that Drew gave me-Jane Austen Knits, Fall 2012 Special Edition. Doesn't he know he's feeding my knitting AND Jane Austen addiction. There are at least 5 knitting projects I want to knit from this magazine, including Walking to Meryton Bonnet, a Bonnet for Baby Emma, and Lydia's Tunic. Have you purchased any of the Jane Austen Knits? If so, what did you think of them? What are you knitting or reading this week? Great colors! What fun to watch your project progress like that. Thanks!! I'm enjoying it, especially since there's a wee bit of a mystery. What will be the next thing the pattern will tell us to do? What a great Christmas gift!! I've never heard of that book. I agree. I think they publish it 2-4 times/year-with different patterns in each magazine. as i love knitting and jane austen is my favourite autor i just have to buy this magazin! You're welcome. Thank you for the compliments. I bought a copy of Jane Austin Crochet for my d.i.l. last year, but I'm not sure she's made anything form it; maybe I should take a look. 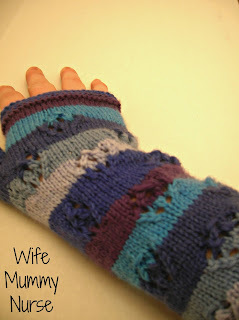 :) Your mitts look great, Sarah! I didn't get a y.a. post up this week, next week, I hope! Thank you. I enjoy Austin. I'll be looking forward to your yarn along post next week. It is good to finish up projects before jumping into new ones. I sometimes get so excited to start a new one that I put aside ones that are in progress. I have an afghan that I need to finish but it is so big I just get distracted and want to do something with a little faster gratification. This week my son asked for a crocheted pet hedgehog. That has been a fun project. Next - knight armor. And there is still half that afghan to go. Looks like lots of fun projects in that new book.